Jeremy grew up here in Wakarusa, and trusted Christ at a young age while attending a church camp. As he matured, he sensed the Lord working in his life and calling him into the ministry. He graduated with both a Bachelors (2006) and Masters (2009) degree in Pastoral Studies. Jeremy has completed two church internships, both of which were here at Bible Baptist. He has counseling experiences from summers spent at Christian camps, as well as six years of ministry at a homeless mission while in school. 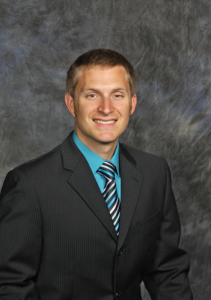 In 2010 Jeremy began ministering part-time at Bible Baptist Church while working a secular job in town. In 2013 Jeremy came on staff full-time as outreach and visitation pastor. Jeremy and Karina met during their first year of college and were married in July of 2006. They have two children, Carson (born in October 2009) and Holden (born in May 2015). They have enjoyed seeing the hand of God lead and provide as they serve Him together. Jeremy and Karina are especially thankful for the opportunity to minister at Bible Baptist and are earnestly praying to see God do great things in this place.